BabyNaturopathics.com - Organic Cotton Baby Kimono With Cattail Embroidery By Baby Naturopathics - Baby Naturopathics Inc. Yes, weeds can be beautiful! Make a statement with this unusual kimono top. This baby kimono is smart, comfortable, practical and of course 100% natural. Natural: Because it's made of organic cotton, dyed with organic dyes, and fully certified by SKAL International. Comfortable: Organic cotton is naturally soft because its fibres haven't been weakened by the chemical processes and additives used to finish and dye�traditional cotton. There's quite a contrast between the feel of a organic cotton garment and that of a conventional one. 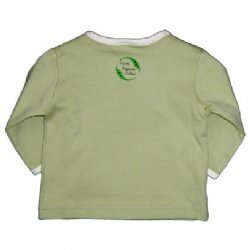 Organic cotton is also more breathable and�is therefore a good choice for babies and children suffering from eczema or heat rashes. Practical: A kimono will make dressing your baby a little easier. Babies tend to fuss when a shirt is pulled over their head. Since our kimono has tie closures, your baby will more feel comfortable during clothing changes. In addition, because of the way kimonos are designed, there's a double layer of�fabric�in the front - keeping�baby's chest and belly warm. 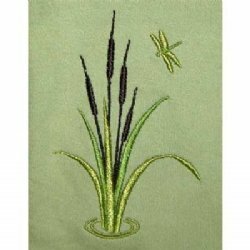 Smart: This kimono has a cattail / bulrush and dragonfly design. The colors of each�cattail design have been customized to match each kimono shirt color. So feel free to buy one of each color! Every kimono also has our organic cotton "leaves" logo embroidered in the back.